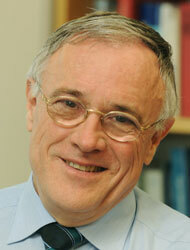 Since 1989, Klaus Müllen has been serving as director of the Max Planck Institute of Polymer Research. He stands among the most creative and influential contemporary chemists. His scientific discoveries have been awarded many times, most recently he received the Carl Friedrich Gauß Medal and the ACS Award in Polymer Chemistry as well as honorary doctorate degrees of the Karlsruhe Institute of Technology (KIT) and of the University of Ulm. In 1999, he was appointed as member of the Academy of Sciences Leopoldina, in 2012 he has become corresponding member of the North Rhine-Westphalian Academy of Sciences, Humanities and the Arts, and in 2013, he has been granted an honorary membership of the American Academy of Arts and Sciences. Klaus Müllen's broad research interests range from the development of new polymer-forming reactions to the chemistry and physics of small molecules, graphenes, dendrimers and biosynthetic hybrids. He is famous for his pioneering research in the field of materials synthesis and for his identification and application of nanographenes. As a GRC fellow, Klaus Müllen will chair a research group at the Institute of Physical Chemistry of the JGU and he will continue his collaborations with scientists in the areas of chemistry, physics and life sciences at Mainz. Press release "Klaus Müllen receives Hermann Staudinger Award 2016"
Press release "Measuring optoelectronic properties: graphene nanoribbons proved to be ideal for photodetectors and telecommunications devices"
Press release "Klaus Müllen becomes a new Gutenberg Research Fellow"